Following numerous postponements across the division last weekend, OEs were able to move five points clear at the summit after their thumping victory over Loughborough Students. However, their promotion ambitions will be put to the test in Round 22 against a Chinnor side who they have not beaten since November 2015. Matt Williams’ s men are undefeated in four matches against the league leaders and Chinnor will be keen for that record to continue as they look to return to winning ways. OEs’ title rivals Ampthill & District, Blackheath and Rosslyn Park will be hoping Gavin Lach’s side slip up this weekend as they look to close the gap at the top. The A’s travel to Cinderford and Park host Sale FC while ‘Club’ will be aiming to bounce back from a disappointing series of results against Birmingham Moseley. In terms of the relegation battle, Loughborough will be keen to put last week’s loss to Old Elthamians to one side when they visit Darlington Mowden Park while Esher travel to Rotherham Titans as they look to hit back after losing to rivals Bishop’s Stortford in Round 21. Speaking of Stortford, they are one of the in-form sides in the division after four wins on the spin and they face another team going through a purple patch in the shape of Plymouth Albion, while elsewhere, Cambridge take the trip to the North-West to face Caldy. Two old foes meet at College Meadow this weekend when Old Elthamians host Chinnor. OEs were one of only a handful of teams who were in action in Round 21 – due to the postponement of fixtures across the National Leagues – and Gavin Lach’s side were able to extend their lead at the top of National One. They comprehensively beat Loughborough Students and OEs are now five points clear at the summit, having played a game more than their title rivals. Five changes to the @ElthamiansRFC line-up to face @ChinnorRugby tomorrow. OEs head into this weekend having won their last four matches while Chinnor will be itching to resume their campaign. Their game with Rotherham Titans was called off last weekend, but prior to that, they were well beaten by Bishop’s Stortford and a tough run of results in January means the Oxfordshire outfit will be keen to return to winning ways in Round 22. Chinnor, who currently sit sixth in the table, are actually unbeaten in their last four meetings with OEs so can they extend that positive record on Saturday? Ampthill and District could only sit and watch as Old Elthamians extended their advantage at the summit of National One last weekend. OEs ran in 10 tries against Loughborough Students to move five points clear at the top, while Ampthill’s game with Caldy was called off due to the bad weather. The A’s are back in action on Saturday against Cinderford and they will be aiming to maintain their excellent recent form as they look to reassert some pressure on OEs. Unlike Ampthill, Cinderford did play in Round 21 but their three-match winning run came to halt as they were beaten by Plymouth Albion. Paul Morris’ side slipped down to eighth in the table following that defeat, but the Foresters are back at Dockham Road in Round 22 and they haven’t dropped a single point at home for two months. 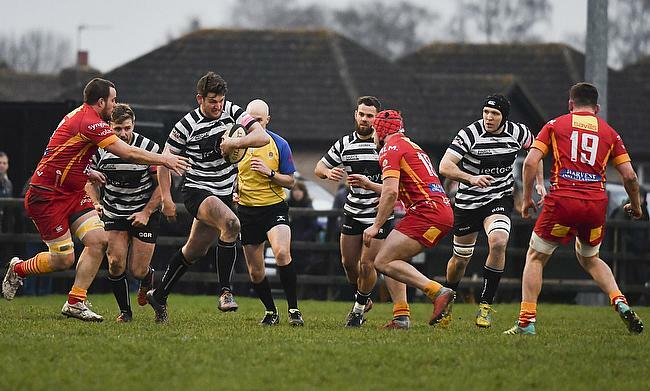 It’s three straight bonus-point victories for Cinderford on their own patch and they will have their sights set on adding to that statistic when they face one of the title contenders. A tough 2019 continued for Blackheath last Saturday. After entering the New Year following a victory over promotion rivals Old Elthamians, James Shanahan’s side are currently experiencing a blip in form. ‘Club’ were one of the teams in action in Round 21, but they couldn’t capitalise on other postponements as they fell to a defeat against Cambridge after holding a 22-3 lead at half-time. It means Blackheath have lost four of their last five matches since the beginning of January and the men from Well Hall sit eight points behind the table toppers so they will be hoping for a reaction when they travel to Birmingham Moseley on Saturday. As for the hosts, they have had two weeks off after their game with Rosslyn Park was cancelled in Round 21 and the Midlands club are now three points shy of safety. Richard Protherough’s side did produce some encouraging performances in January so they will now be aiming to build on their improvements as they look to dig themselves out of trouble. Rosslyn Park were not involved last weekend as their fixture with Birmingham Moseley was postponed, but their spirits should still be high heading into Round 22. At the end of January, Kieran Power’s side bounced back from successive defeats as they beat fellow promotion candidates Blackheath and they are now nine points behind the leaders, but Park do have a game in hand. The men from the Rock entertain Sale FC this weekend, who like their hosts, weren’t in action last Saturday after their clash with Darlington Mowden Park was disrupted by the weather. The last couple of months has been positive for Jonathan Keep’s side as they have picked up three wins from their last five matches, which leaves Sale three points clear of the drop zone with a game in hand. The Manchester-based side lost 31-23 to Park back in October so they will be keen to upset the odds and reverse that scoreline this weekend. Rotherham Titans may not have been overjoyed to hear their clash with Chinnor was cancelled last weekend after suffering a setback in Round 20. Joe Barker’s side were left stunned following a defeat to bottom of the table Loughborough Students and after last Saturday’s postponement, they were unable to produce an immediate response. The fifth-placed side are now 17 points behind league leaders Old Elthamians with a game in hand, but they must improve on one win from their last four matches if they are to stand any chance of reigniting their promotion ambitions. They may see this fixture with Esher as the perfect opportunity to get their season back on track as the Surrey-based side currently occupy a spot in the relegation zone. Ricky Nebbett’s men suffered a blow in Round 21 as they lost to rivals Bishop’s Stortford and now Esher are three points from safety, but they have played a game more than some of the teams around them. The fact a fellow bottom three side in the form of Loughborough managed to clinch a victory away at Rotherham, may give Esher some encouragement but it is clear both sides would benefit from a morale boosting win in Round 22. Bishop’s Stortford and Plymouth Albion are two of the form sides in National One and the teams meet this weekend at Silver Leys as they aim to maintain their momentum. Albion arrive in Hertfordshire oozing confidence after a complete turnaround in their season. Following a stuttering first few months of the campaign, Kieran Hallett’s side have clicked into gear and they enter Round 22 having won seven of their last eight games. A solid performance against Cinderford last Saturday only added to the feel-good factor at the club, but the buzz surrounding Stortford is also growing. Andy Long’s men have picked up four straight victories since the start of January and their latest win over Esher has seen them move out of the relegation places and three points clear of the drop zone. Both sides are currently flying so something has got to give this weekend. Darlington Mowden Park are back in action this weekend following the postponement of their fixture with Sale FC in Round 21. Last time out for DMP, they were left frustrated as they had to settle for a draw against Birmingham Moseley so back at the Northern Echo Arena, Danny Brown will be eager to see a reaction from his players when they host Loughborough Students this weekend. The Students did play last Saturday, but they may have wished their match with Old Elthamians had been cancelled. The division’s bottom club conceded 10 tries against the league leaders and Alan Buzza’s side are now six points adrift of safety, but they have played a game more than some of their rivals. Loughborough have won just once on their travels this term, but that did come in their last away outing against Rotherham Titans so the Students will be hoping for a similar outcome in the North-East. Across the 13 matches that took place in Round 21 on a weather affected weekend, Cambridge’s victory against Blackheath was arguably the standout result. The Blood and Sand produced a remarkable second-half fightback to defeat the promotion candidates at Well Hall and the win also saw Richie Williams’ side move away from the relegation places. The men from Volac Park are now six points clear of danger and they have a real chance of distancing themselves from the drop zone once again when they travel to Caldy this weekend. The Wirral outfit host Cambridge having lost their last six games and it means they now sit just three points above the trapdoor. Caldy have won on just one occasion since the middle of November, but they did beat Cambridge 27-22 earlier in the season. Back then, the men from Paton Field were enjoying a strong start to the campaign, but now, a similar result would be a very welcome boost.